Amanzi 1902 is a luxurious, self-catering, beachfront apartment in a prime position on the 19th floor. It offers 2 bedrooms and 2 bathrooms, accommodating up to 5 people. The main bedroom has a double bed and a room safe for your valuables. The 2nd Bedroom has a Tri bunk Bed (double bed with a single bed above it). The unit offers breath-taking 180º sea views from both bedrooms and the lounge- perfect for dolphin and whale watching. This beautiful holiday flat consists of a lounge with a Flatscreen Tv, Blue Ray DVD Player and a DStv connection point (Bring your own Decoder and Smart Card). There is also a dining area and fully equipped kitchen with fridge/freezer, washing machine and tumble drier. Housekeeping is not included, but for your comfort and convenience a maid service can be arranged at an additional charge. Bedding and linen are supplied but please bring your own towels. There is a swimming pool and braai area in the complex for your enjoyment, with shopping, restaurants, and beaches all within walking distance of the unit. The entrance to the complex is well secured, and safe undercover Basement Parking is available. Additional parking can be arranged on request. 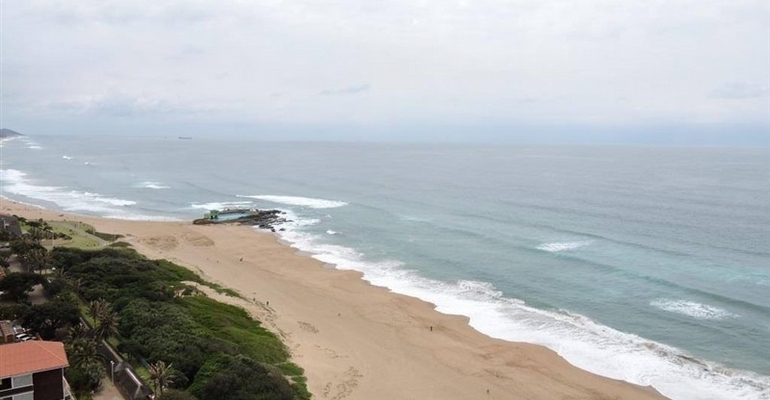 The building offers direct access to the main beach (protected by shark nets) with a life guarded adult and kiddies pool right on the rocks. Starting from R450.00 per night. Please contact us for a detailed quote.